Al Percolo is a Major League Baseball scout with the New York Yankees who attends a game at a small college to see pitcher Tommy Lacy. Al gets himself invited to dinner at Tommy's house and convinces him and his Catholic parents that Tommy should sign a contract with the Yankees, which he does. Just as Tommy is about to make his major league debut, Al's latest discovery suffers an extreme case of stage fright. It leads him to vomit on the pitcher's mound at Yankee Stadium. After this embarrassment to the organization, Al is banished to the Mexican countryside. While attending a game in Mexico, he gets his first look at Steve Nebraska, a young American with a consistent 100+ mph fastball and hits home runs on seemingly each at-bat. Steve is very popular with the fans, especially females. Al notifies the Yankee brass of his find, but he is fired and told not to bring anyone back. He takes Steve back to the United States with him, becoming his unofficial agent. Steve freaks out in the middle of the terminal at Newark International Airport when he momentarily thinks Al is missing. Al arranges an open audition at Yankee Stadium in front of representatives from every Major League Baseball team. A bidding war ensues after Steve strikes out Keith Hernández and homers off Bret Saberhagen. Nebraska signs a $55 million contract with the Yankees. Difficulties arise as Yankee management demands that the eccentric Steve be psychiatrically evaluated in order to ensure he will not turn out to be as unstable as Al's earlier finds. Al picks a psychiatrist named H. Aaron and expecting a quick evaluation, followed by a massive payday for both Steve and himself. The doctor finds Steve to be a deeply troubled young man, severely abused as a child that he's blocked almost every memory of his early life. Al begs the doctor to grant a positive evaluation, promising her that Steve will undergo therapy before beginning his professional career. She gives her reluctant consent. When the Yankees reach the World Series. Steve is contractually obligated to pitch in Game 1, despite not being mentally prepared to do so. By the night of the big game, Steve ends up atop Yankee Stadium, refusing to come down to pitch. Al pleads with him to play. His conscience gets the better of him and Al offers the kid a chance to walk away from it all, no strings attached. 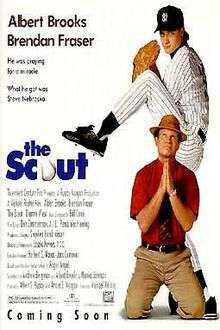 The scout's loyalty convinces Steve to face reality and is. Steve pitches a perfect game, striking out 27 St. Louis Cardinals batters on 81 consecutive strikes. Steve hits two solo home runs.in a 2-0 Yankees victory. Though the Yankees win the game, it is never made clear who won the Series, but for Al and Steve, a perfect game is a perfect ending. Bob Costas, Tim McCarver, Tony Bennett, John Sterling, Keith Hernández, Bret Saberhagen, George Steinbrenner, Brian Cashman, Ozzie Smith and Bobby Murcer, among others, play themselves in the film. ↑ McGilligan, Patrick. Backstory 5: interviews with screenwriters of the 1990s. University of California Press, 2009.